This one is a display promoting their Summer Reading Progamme: "Many Worlds, Many Stories"
'I paper mached the hot-air balloons. 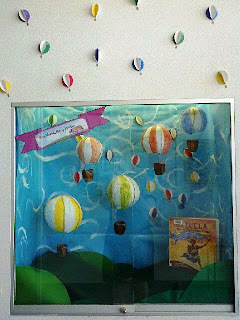 Once they dried, I spray painted them white and then painted on the stripes, then I took 2 pieces of twine and made an "x" on the top of the balloon and hot glued it down. After, I took a small dixie cup, wrapped it in brown tissue and punched 4 holes on the top rim then tied the twine to it. Last, I tied a piece of clear thread on top to hang it up with'. Double click on the picture to see it closer. It's gorgeous Krystal! Thanks.